The ruggedised laptop has eclipsed the desktop in terms of popularity when it comes to choosing a computing platform. Even with the growing deployment of tablet computers the ruggedised laptop is often the form-factor of choice across numerous industries and applications. Users are comfortable with laptops. Because it is a familiar, with a standard keyboard, network options, and traditional I/O ports, it is often the ideal device for distributed computing applications. Glacier rugged laptop computers span an array of industries, organizations and environments. These environments can be challenging from several respects and include shock, vibration, water, chemicals, dust, dirt and extremes of temperature. The user can also pose a “challenge” to the device. They are focused on the task at hand and the computer is just another tool to get the job done. Rugged laptop computers will be subjected to bangs, drops, splashes, stressed hinges and multiple twists and turns to the carry handle. 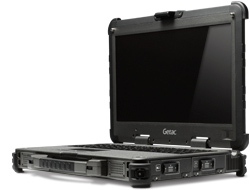 Glacier represents the industries’ best rugged laptop computers from Getac. 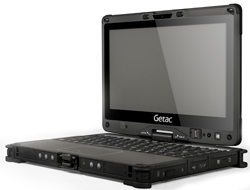 Since 1989, Getac has been designing and manufacturing the best in durable rugged notebooks and, today, offers a line covering any need where durable laptops for tough environments may be required. Getac’s most durable laptops - semi-rugged S410, fully-rugged B300, fully-rugged convertible V110 and ultra-rugged X500 - bring Intel iSeries computing power to locations including; public safety, construction, utilities, warehousing, distribution, manufacturing, healthcare and field-service. A ruggedised laptop is highlighted by several aspects that distinguish it from a commercial unit. These include IP65 sealing, MIL-STD- 810G durability testing, covered I/O. reinforced hinges and handles, sunlight readable displays, Corning Gorilla glass touchscreens, and waterproof backlit keyboards. While rugged, these laptops boast significant computing power and features: Intel ISeries processors, 802.11ag radios, 4G LTE, 16 GB DRAM, 512GB SSD and the latest in both LAN and WWAN communications. 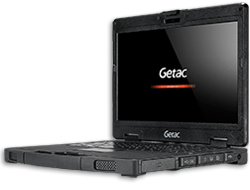 Boasting battery life up to 30 hours and displays that can be read in any ambient conditions, Getac rugged laptop computers are the ideal rugged computing platform for the remote worker. Common Glacier ruggedised laptop users include public safety officers, field service technicians, construction supervisors, chemical plant and launch pad personnel, soldiers and sailors, and utility technicians. Applications within these organizations include retrieving vital records, submitting updated conditions, updating inventory, ordering a part for repair and completing an inspection report. Class 1 Div II rugged laptops allow for these same safe operations within chemical, paint and other potentially dangerous environments. 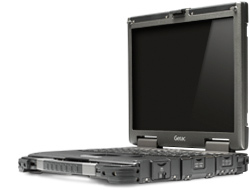 Getac rugged laptop computers also come with a large choice of upgrades and accessories. Upgrades include faster processors, a media bay, second hard drive and night-vision capability. Accessories include vehicle and desktop docks, vehicle power converters, carry cases and straps, extra batteries and multi-bay battery chargers. While Glacier and Getac strive to provide the most durable ruggedised laptop based on the environment and application, a robust warranty is provided at no extra charge, just in case. All Getac fully rugged units come with a 3-year bumper to bumper warranty as a standard offering. And, longer warranties are available as an upgrade.